Well, we’re both tired of being in the Jeep and are swinging towards home. Gonna dump a ton of junk that hasn’t been used once, give Mayo some more room to laze in the back seat. Hopefully be able to put the top down without risk of losing something. Then a few days in Madison, a little quiet time, maybe do a bit more RV shopping, then off to parts eastward. The western loop was OK, but since I grew up in California, I’ve kind of done it all before. The next loop should be quite a bit more interesting, as we’ll be going through several states that I’ve never visited, and we should also have our travel logistics polished. Not hamburger or steak. Mooing, preprocessed cows. The picture is, I believe, of an F-11F dressed out in Blue Angels colorings; it was mounted, without markers or identification of any kind, in a field just across from the Motel 6 in Grand Junction that we stayed at. The F-11 was one of many interesting yet short-lived models from the “Golden Age” of jet design in the 50’s – 60’s. It was one of the last single-engine ( or single-tail) fighter jets used by the Navy. It was replaced after just a few years by the amazing F-8 interceptor, then the hulking F-4 Phantom II multirole airframe. It took me a while to ID the plane. The single engine really threw me. 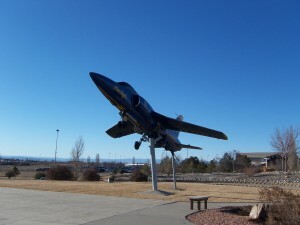 The F-11 looks quite modern, and has landing gear that’s similar to the F-18 (which both the Blue Angels and Navy combat units currently fly). Speaking of unexpected sightings, I saw no less that 8 automotive prototypes while driving the Rockies. 6 were in a tight group that zoomed past me while climbing towards Vail Pass. Even though they were covered with black cladding and tape, I thought that they were shaped like the Mazda 3, except with a Porsche-style “whale tail”. They were remarkably fast while climbing the steep grades, and were really fun to watch while they played “follow the leader” through the slower traffic. The other two mystery cars were parked at a rest stop; they sped away while I fumbled to get my camera out. Only their trunks were covered, and I think that they were Chevy Cobalts, probably with the Super Sport package. Zoom zoom zoom, indeed! 2 Responses to Survey says: "Cow!" The Thunderbirds beat the Blue Angels all hollow! Didn’t you see any of those planes while going through Nevada (Nellis is home base) or Colorado (academy)? The cars sound cool, the highway smell much less so. Mmmm…. Tasty aroma of cow…. That’s a long way to travel in tastable air.